"Jeb, Neil, Marvin, Doro and I are saddened to announce that after 94 remarkable years, our dear Dad has died," his son, former President George W. Bush, said in a statement released by family spokesman Jim McGrath. 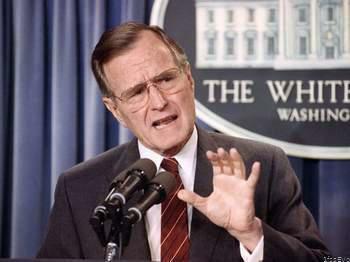 “George Herbert Walker Bush, was a man of the highest character and the best dad a son or daughter could ask for. The entire Bush family is deeply grateful for 41's life and love, for the compassion of those who have cared and prayed for Dad, and for the condolences of our friends and fellow citizens." Bush's death comes months after the passing of his wife of 73 years, Barbara. The president who managed the end of the Cold War and forged a global coalition to oust Iraqi forces from Kuwait, has died at age 94. In a political career that spanned three decades, he lost his bid for re-election and lived to see his son win the Oval Office.